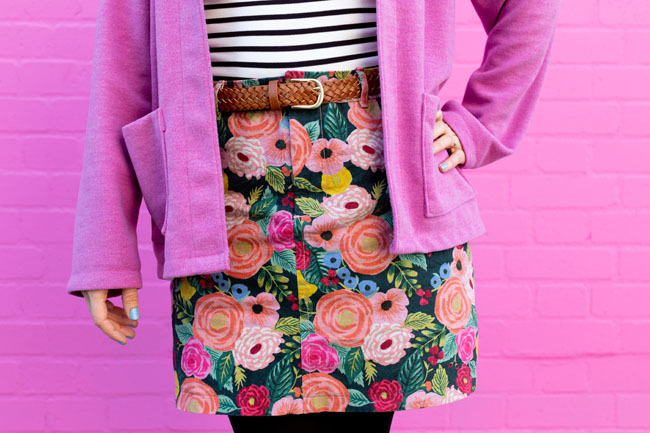 Do you buy fabric with a pattern in mind, or do you figure out what to do with it afterwards? Sometimes working out what to do with a piece of material can set a lightbulb off in your mind. 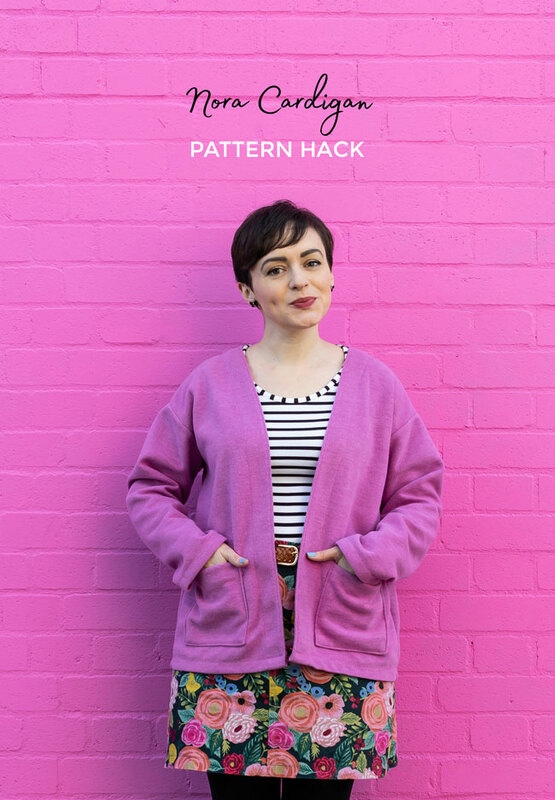 I came up with the idea of hacking the Nora top pattern into a cardigan came when I was mulling over what to do with an unusual piece of fabric I’d bought from Fabrics Galore. It's a very low stretch knit that is very structured and feels almost like a wool or felt, but softer. I couldn't resist the colour, but didn’t want to make a regular Nora top as the fabric would feel scratchy around my neck, plus it’s such low stretch that I wasn’t sure it’d go over my head. 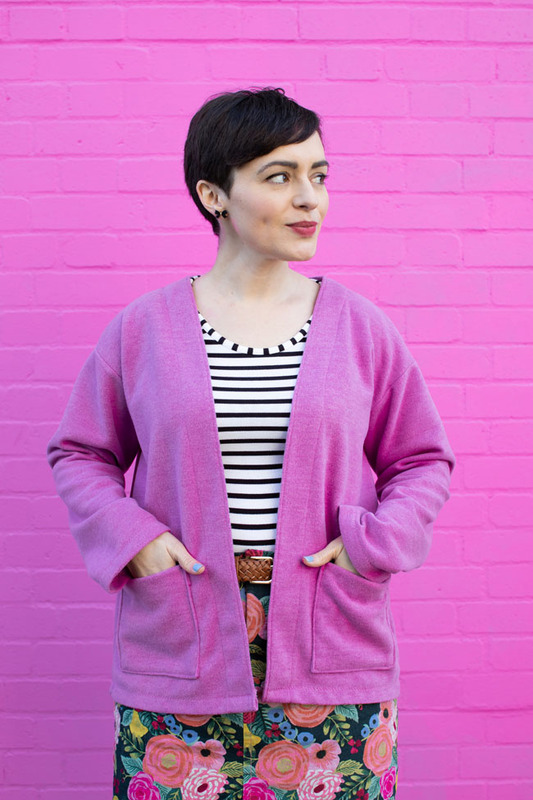 So I decided to take out the neckline and turn it into a slouchy, boxy cardigan instead. 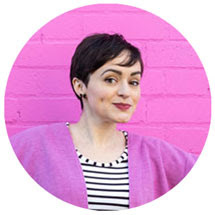 First I redrew the neckline on the front bodice, reducing the shoulder slightly and creating a V-neck opening that curves into the original centre line on the pattern. When you're redrawing pattern lines like this, try to make the corners 90 degree angles so they match up neatly. Then I drew a second line 6.5cm (2 1/2in) inside the neckline and centre front to mark the inside of the facing. I knocked back the shoulder and neckline on the back bodice the same amount as on the front bodice, and drew on the inside line of the facing too, again at right angles to the shoulder. You can place the front and back bodices together at the shoulders to ensure the facing edges will join up when sewn. I then traced off the facing pattern pieces onto a new piece of paper, and trimmed 2mm (1/16in) from the neckline/front opening to help the seams roll to the inside when sewn. I drew a grainline arrow onto the front facing parallel to the centre front edge, and a 'place on fold' arrow on the centre back of the back facing. Markings like this are a godsend to remind yourself what you're doing when you're cutting out late at night after a long day! 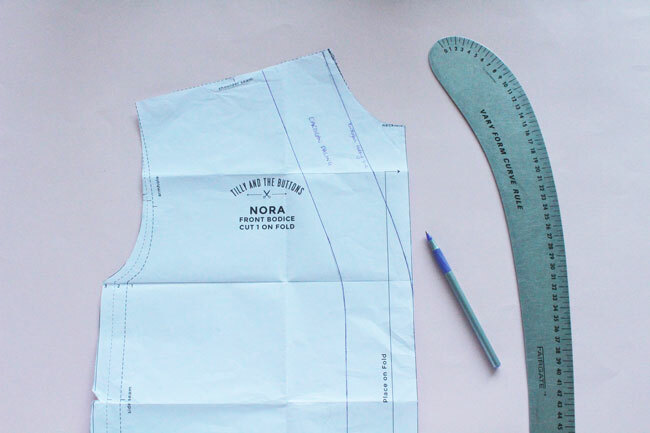 Cut two front bodice pieces (rather than cutting one on the fold as you'd do for the regular Nora top) using your new neckline cutting line as a guide, and cut two front facings. Cut one back bodice piece on the fold with the altered neckline, and cut one back facing on the fold. 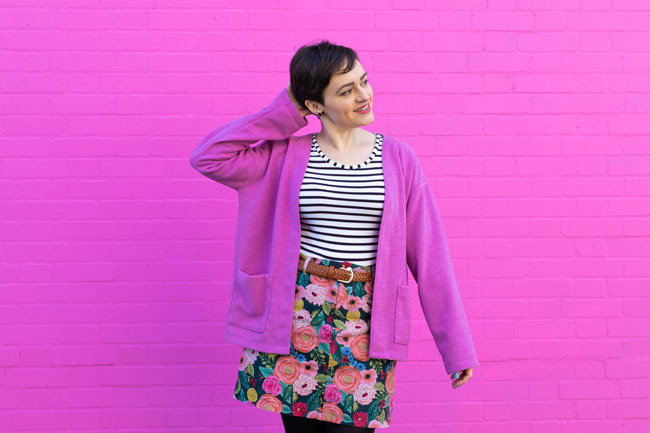 I didn’t interface the facings as the fabric is so structured I didn’t feel it needed it – but if you’re making your own in a stretchier knit, you may want to try adding a knit interfacing to create stability around the front opening. 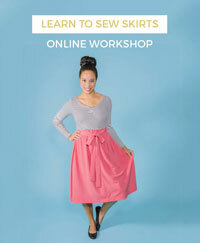 Test it out on a scrap of fabric and see what you think. To sew it all together, join the shoulders as normal (see the pattern instructions), and join the facings at the shoulders too, trimming and pressing open the seam allowances. Finish the outer edge of the facing with an overlocker (serger) - or you can leave it raw if you don't have one as knit fabrics don't fray. Lay the facing over the bodice, right sides together, and pin them together around the neckline/front openings. Stitch. Trim the seam allowances and clip the curves to open out the seam allowances. 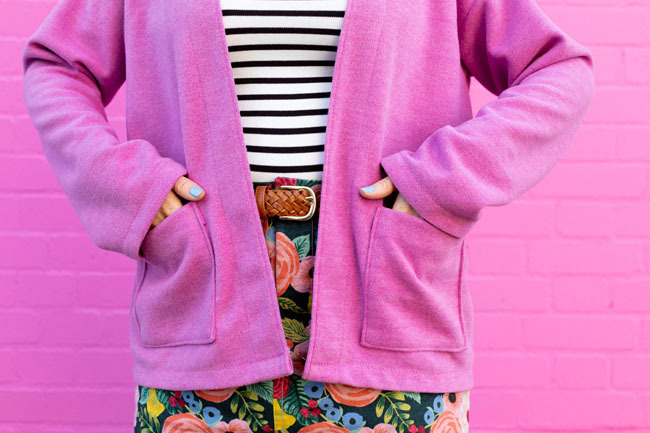 Then you can attach the sleeves, sew up the side seams, and hem the cardigan to your preferred length. 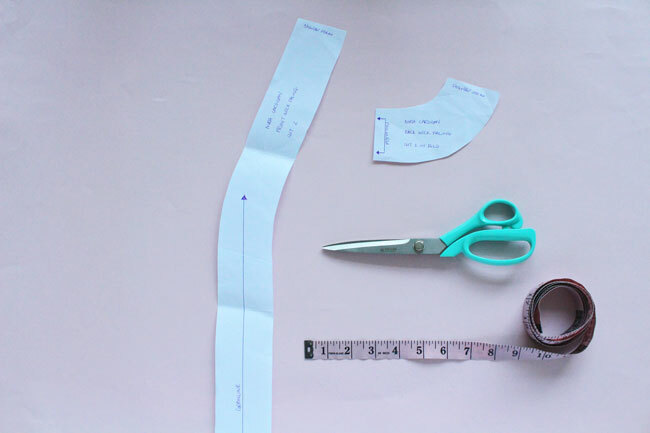 I went for a high hip length, but you could make it longer using the longline hem cutting line on the pattern. 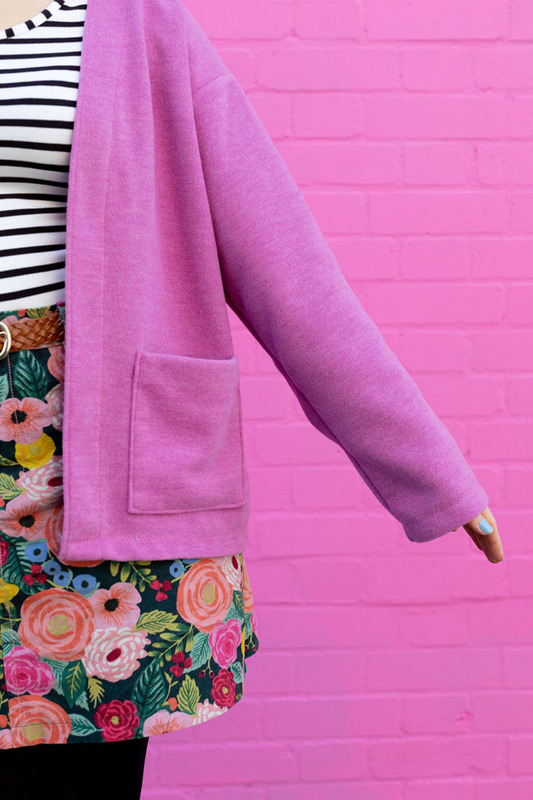 I also added some simple large square patch pockets to my cardigan. Because everyone loves pockets! Any questions about these steps, do let me know in the comments. 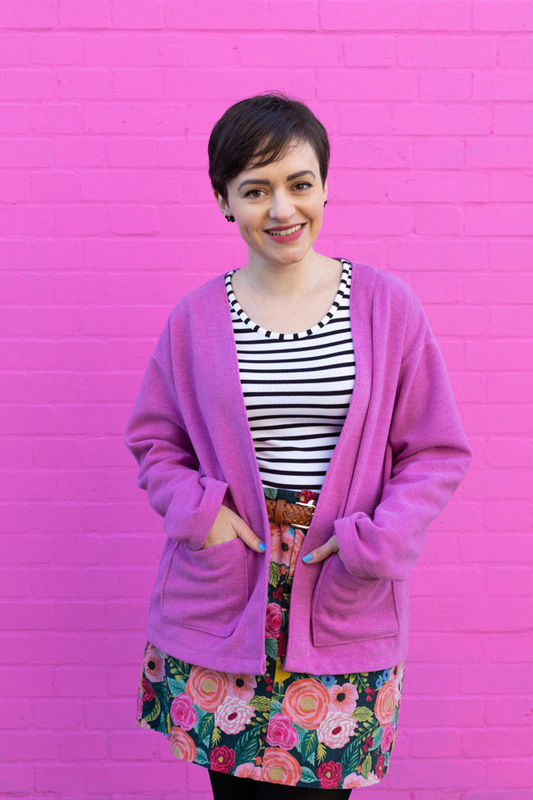 If you make your own Nora cardigan, I'd love to see it! 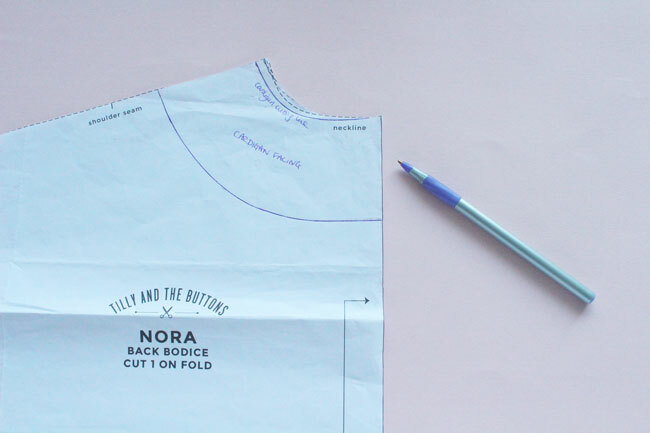 Please share with us on Instagram @TillyButtons #SewingNora so we don't miss it. With thanks to Dress Like a Mum for painting the wall!